In this circuit, we are using a 16*2 LCD to display the time using DS3231 RTC Module with Arduino UNO. 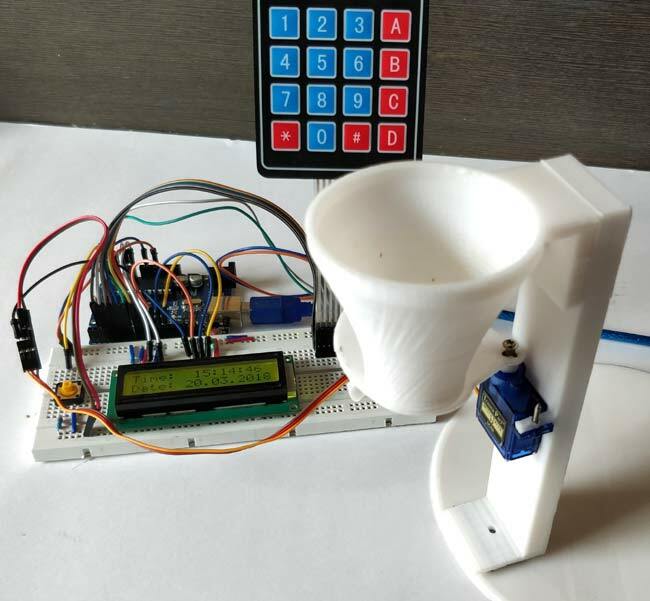 Also, a servo motor is used to rotate the containers to provide the food and 4*4 matrix keypad to manually set up the time for feeding the Pet. You can set the rotation angle and container opening duration according to the quantity of food you want to serve to your pet. The quantity of food may also depend upon your pet whether it’s a dog, cat or bird. In this Arduino based Cat Feeder, for Getting Time and Date, we have used RTC (Real Time Clock) Module. We have used the 4*4 Matrix Keypad to set the Pet’s eating time manually with the help of 16x2 LCD. The Servo motor rotates the container and drop the food on the time set by the user. The LCD is used for displaying the Date and Time. Complete working can be found in the Video given at the end. If you are new to 3D printing here is the starting guide. You can download the STL files for this pet feeder here. DS3231 is a RTC (Real Time Clock) module. It is used to maintain the date and time for most of the Electronics projects. This module has its own coin cell power supply using which it maintains the date and time even when the main power is removed or the MCU has gone through a hard reset. So once we set the date and time in this module it will keep track of it always. In our circuit, we are using DS3231 to feed the pet according to the time, set up by the Pet’s owner, like an alarm. As, clock reaches to the set time, it operates the servo motor to open the container gate and the food drops in the Pet’s food bowl. Note: When using this module for the first time you have to set the date and time. You can also use RTC IC DS1307 for reading the time with Arduino. Automatics Pet Feeder’s Complete Arduino Code is given at the end. In the below code, we are defining libraries, “#include <DS3231.h>” for RTC module, “#include <Servo.h>” for Servo Motor, “#include <LiquidCrystal.h>” for 16*2 LCD, and “#include <Keypad.h>” for 4*4 Matrix Keypad. In the below code, we are defining the keymap for the 4*4 matrix keypad and assigning the Arduino pins for the Row and Columns of keypad. Here, we are creating the keypad by using the command below in the code. Assigning A4 and A5 Arduino pins to connect with SCL and SDA pins of DS3231. Also, assigning pins to the LCD and initializing the Servo motor. In the below code, we are declaring the t1 to t6, key, and array r, and the feed. In the below code, we are setting up all the components for the start. Like in this code “servo_test.attach(10);” Servo is attached to the 10th pin of the Arduino. Defining A0, A1 and A2 as the Output Pin and initializing LCD and RTC module. Now, how the loop is working is the important part to understand. Whenever the Pushbutton is pressed, it goes high means 1, which can be read by “buttonPress = digitalRead(A3)”. Now it goes inside ‘if’ statement and calles the ‘setFeedingTime’ function. Then it compares the real time and the entered time by the user. If the condition is true which means the real time and the entered time is same, then the Servo motor rotates to and angle of 100 degree and after 0.4seconds of delay it comes back to its initial position. In the void setFeedingTime() function code, After pressing the pushbutton we are able to enter the pet feeding time, then we have to Press ‘D’ to save that time. When the saved time matches with real time then servo start rotating. After uploading the code to the Arduino Uno, the time and date will be displayed on the 16*2 LCD. When you pressed the pushbutton it asks for Pet’s feeding time and you have to enter the time using the 4*4 matrix Keypad. Display will show the entered time and as you press ‘D’ it saves the time. When the real time and the Entered time matches, it rotates the servo motor from its initial position 55⁰ to 100⁰ and after a delay again return to its initial position. Therefore, Servo motor is connected to the Food Container gate, so as it moves, the gate will open and some amount of food falls in the bowl or plate. After a delay 0.4 seconds Servo motor rotates again and close the gate. The whole process completes within a few seconds. This is how your pet get the food automatically on the time you entered. is that code is right?? i try to install it in arduino but its fail. some of the codes i'm trying to upload but i get errors! !Pls help!! You probably typed it in wrong. Check again. It keeps displaying the stuff after the button is pressed without even pressing the button and then sometimes it just doesnt work at all. What do I have to change in the code if I am using a I2C LCD Display instead of the normal 16 pin one like in this example? Excuse me what meaning the number 48 has in setting the time. can anyone upload a picture of the board and the file to their code? I've tried to wire everything according to the video. However, it is not working. does anyone have a picture of their board and arduino with their wiring? does anyone have a modified code? Do you think you could upload a picture of the setup where we can clearly see where everything is going? The wiring diagram is different from the setup in the video. We aren't sure which to follow. Follow the circuit digram guys, its the best way to get it done. Dont relay on wiring pictures. Some of the codes I'm trying to upload but i get errors...Pls help!! What problem are you having? only if you brief that people here might be able to help. Can I program several feeding times a day, or only once? Please guide me how can I tweak the Arduino code to feed several times. I made a tweak and it's not working. That's why I need the guide line. Please help me to feed my cat with this. Please. i can not see the colors clearly. what is the value of the resistors? What if I want to set 2x what can I do? I try this code but after I set the time, it doesnt return to the time and date. How can i program it using DS1302 RTC and 16x2 lcd with backpack? How did you do the code to fix black boxes? what software application is using to apply the code? Black boxes are not a problem, it means that the LCD is initialized by did not receive any data to display.